(Clock-wise) Sayeeda Khanam (centre) and Dr. Hamida Hossain inaugurate the exhibition at La Galerie, Alliance Francaise de Dacca. Photographs of Nurjahan Begum and Suhashini Das. A five-day digital biography and photography exhibition titled "Jibon O Chitrey Gunijan" ended at the La Galerie, Alliance Francaise de Dacca, Dhanmondi yesterday. Initiated by 'Gunijan Karmasuchi' and in association with Alliance Francaise de Dacca, the exhibition started on January 6. The exhibition highlighted eminent personalities who have made immense contribution to nation building. The first female photographer of the country, Sayeeda Khanam, inaugurated the exhibition. Renowned human rights activist, Dr. Hamida Hossain presided over the inaugural ceremony. 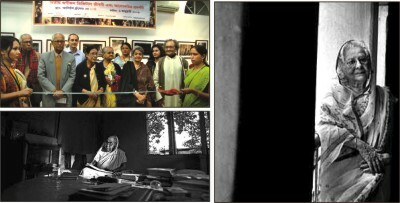 The exhibition displayed 55 photographs of eminent personalities, taken by four photographers -- Din Mohammad Shibli, Partha Pratim Sadhu, Arman Hossain Bappi and K.M. Asad. The digital biography exhibition highlighted audio-visual interviews, writings, and biographies of the public figures, which were displayed on laptops. At the inaugural programme, a number of renowned personalities including Rangalal Sen, Sohrab Hossain, Morshedul Islam, Sudhin Das, Ila Majumdar and Sukumar Barua were present. Throughout the exhibition, some of the personalities featured came to the venue and shared their experiences with visitors, especially children. Among them were Rashid Haider and Farida Parveen (on January 7); Professor Zillur Rahman Siddiqui, Aroma Dutta and artist Hashem Khan (on January 8). 'Gunijan' is an Internet based initiative. The purpose of the initiative is to generate information and build a Web based archive highlighting the nation builders. The organisers informed that a project on over 1,000 eminent figures is in the pipeline. Anyone can collect data and information on the personalities featured by logging on to www.gunijan.org.bd. Recently the organisers released a CD version of the project titled "Mahima Taba Udbhashita". Rahim Afroz Bangladesh Ltd. was the sponsor of the exhibition, while Global Brand Pvt. Ltd. provided technical support.